Imagine your TK student learning about China, Germany and Kenya, and then continuing on that global journey to gain the knowledge, skills and character dispositions to make a difference in a rapidly changing world. Learn how our youngest students "go global"
At PDS two of our core values state, "the school community should promote global awareness and connections to the world and local community" and "students should be astute thinkers and persistent, creative problem solvers." To live up to these aspirational goals, we have constructed a unique TK-12 curriculum framework, created or joined global networks for student exchanges, developed a wide array of international trips led by our own faculty, and the nation’s first global studies diploma. 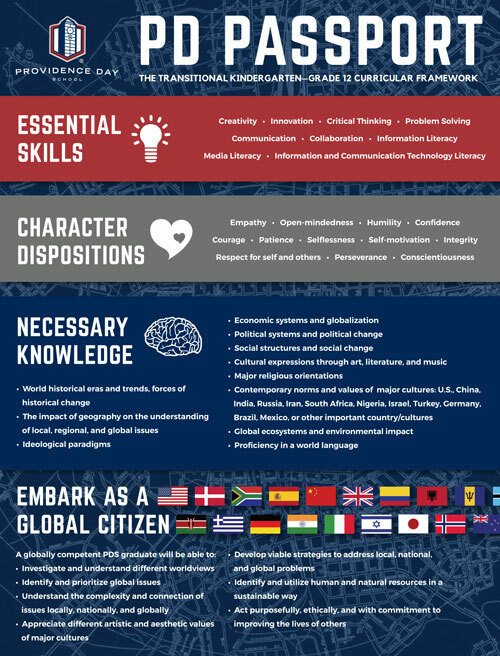 All students at PDS will experience the TK-12 global education framework known as the “PD Passport,” which infuses traditional classes with the content, skills, and character dispositions critical to being a global citizen. Click on the image at right to see the full framework. Beyond the classroom, students have the chance to interact with students from all over the world by traveling to other countries or having them come here. You can check the RoundSquare International webpage to leverage our network of 200 like-minded schools in 50 countries on 6 continents to create your own experience as a hosted student. Additionally we offer Spring Break and summer travel experiences led by our own faculty. Finally, our Upper School students have the opportunity starting in 9th grade to join the Global Studies Diploma program. The mission of the Global Studies Diploma program is to develop within our students an ability to appreciate and value differences locally and globally and to develop the understanding, skills, and character dispositions to become active global citizens. Dr. Loren Fauchier is currently the Executive Director of Global Education at Providence Day School in Charlotte, and the Vice-President of the Global Education Benchmark Group, a consortium of 150+ independent schools in the U.S., Canada, Britain and Turkey. He was the 2014 recipient of the NAIS Global Citizen Award. Before coming to Providence Day, he taught 17 years at Queens University of Charlotte in the Department of Political Science and International Studies and before that at the University of Washington. He is a graduate of the Johns Hopkins University program in Nanjing, China, and completed his doctoral research in China. He frequently travels to China with students. He currently participates in a working group of educational leaders who seek to create schools of the future based on global competencies and self-learning. Jessica Williams is currently the Director of Global Programs at Providence Day School. Raised on a farm in Pennsylvania, Jessica was a first generation college student who fulfilled her desire to travel abroad in college. She loved the experience so much that she studied abroad four times (China, Taiwan, Scotland, and Thailand) in undergraduate and graduate school. A deep desire to help students find their paths and fulfill their dreams led her to work in education where she has over 18 years of experience in admissions, advising, and international education at diverse institutions including the University of Miami, Rollins College, Appalachian State University, Davidson College, and Cannon School. As a heart-centered educator, Jessica values blending deep listening with gentle challenge to encourage students in following their unique paths to an inspired life.